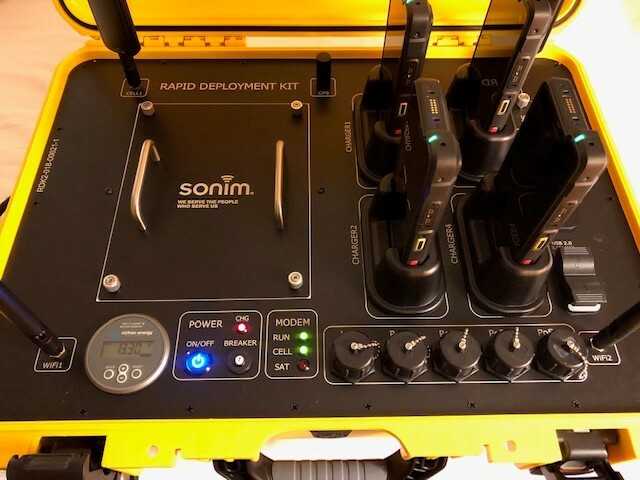 Greater communications flexibility soon will be within the grasp of some public-safety agencies, as Sonim Technologies started shipping its Rapid Deployment Kit (RDK-2) with a FirstNet Ready Cradlepoint router and announced plans to further integrate satellite and LMR capabilities into the carry-case package later this year. Bob Escalle, Sonim Technologies’ vice president for public-safety market segments, said the RDK-2 provides deployable LTE and Wi-Fi coverage in a package that is small enough to be carried to locations where a vehicular deployable is not practical. Perhaps most importantly, the RDK-2 is designed to be deployed quickly at an incident scene by first responders, without any need for extensive special training, Escalle said. “You don’t need to be an engineer,” he said. “You pull it out. You flip up the antennas, because the antennas are foldable—the Wi-Fi pair and the cellular pair. You hit the power button, and you wait for the green lights to come on … and that’s it. Even devices that are not designed to operate on FirstNet can benefit from an RDK deployment, Escalle said. By connecting to the RDK via a Wi-Fi connection in the 2.4 GHz or 5 GHz band, non-FirstNet users at the site can enjoy a broadband connection—with the priority and preemption associated with FirstNet RDK, he said. Developed last year in cooperation with AT&T for FirstNet, a prototype of the package was exhibited last August at the APCO 2018 event as an Emergency Drop Kit. Escalle said the name was changed to Rapid Deployable Kit because the solution can be used in many potential use cases that are outside of an emergency scenario. Each of the RDK-2 units being shipped today is contained in a 25-pound, rugged carrying case with four Sonim XP8 ruggedized smartphones, smartphone charging slots, power-over-Ethernet (PoE) and other ports needed to support interoperable communications and satellite backhaul. Most notably, the RDK-2 includes the new Cradlepoint COR IBR900-1200M FirstNet Ready router, which greatly simplifies the connectivity compared to the prototype that was exhibited last year. “Whenever and wherever trouble strikes, the Rapid Deployment Kit provides first responders with an instantly deployable communication hub that they can rely on,” Todd Krautkremer, chief marketing officer at Cradlepoint, said in a prepared statement provided to IWCE’s Urgent Communications. Escalle said the RDK-2 capabilities in the rugged case—priced at less than $10,000 retail—require some sort of connection to the LTE core or some other IP connection. If no such connection is available on site, the RDK-2 can use an Inmarsat satellite link via a BGAN Explorer 710 terminal to provide the necessary backhaul. The satellite terminal costs an additional $6,000 to $8,000 and is contained in a separate carrying bag, but Sonim hopes to offer a version with the satellite terminal embedded in the rugged plastic case around the middle of the year, according to Escalle. Even when the satellite terminal is deployed, it will be used only when the cellular or other IP connections are not available. Sonim has verified with testing that the RDK-2 will support automatic failover to satellite when an IP connection is not available, and the solution will revert back to the IP connection immediately when that link is available again, Escalle said. Adding to the potential flexibility of the RDK-2 is that units can communicate with each other, so they can be deployed in a mesh or daisy-chain configuration—a capability that can be used to extend coverage of the LTE network, Escalle said. Those seeing the RDK-2 for the first time might be tempted to dismiss it as “just an access point in a box,” but it also includes practical features that are designed to support the overall public-safety mission, Escalle said. “It’s important to have the power-over-Ethernet switch, because this switch is not only a LAN switch for the different ports, but it also has the injector voltage to power things like IP cameras, IP phones—anything that doesn’t require its own power supply can be powered over this RDK,” Escalle said. Sonim Technologies plans to continue development on the RDK, Escalle said. Future options that could be available in the middle of the year include an embedded satellite transceiver and a two-port LMR interoperability gateway, as well the potential inclusion of Sonim LMR Enabled Detachable (SLED), an accessory that is designed to transform a Sonim LTE device into one that also can communicate as an LMR portable, when needed. if you will send me an email, I’ll be happy to provide information on the satellite link. When can we order these units? I am with CALOES in California and we need to get these into our environment ASAP. Please send me a note at your convenience, and I’ll be happy to connect you with some folks who can provide more information on the availability of the RDK-2.